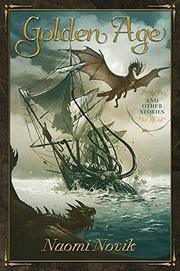 Novik crowned her nine-book Temeraire sequence, an alternate-world Napoleonic Wars featuring intelligent dragons, with League of Dragons (2016) and now weighs in with an associated all-original story collection, each entry occasioned by an accompanying fan illustration. The entries comprise six stories plus 26 “drabbles”—a term, invented in Monty Python’s Big Red Book (1971) and possibly a tongue-in-cheek reference to novelist Margaret Drabble, indicating vignettes of 100 words or less. So accomplished, absorbing, and wide-ranging is Novik’s creation that the stories elicit enormous pleasure even when the contents are slight. Intriguingly, some don’t fit into the canon at all even when the world they evoke is perfectly familiar. In the splendid “Golden Age,” for example, we meet a Capt. Laurence who never encountered the Chinese imperial dragon Temeraire and is still a sea captain; here, he comes upon a similarly huge black dragon who calls himself Céleste and has taken up piracy as a career. “Planting Season” offers a glimpse of independent American dragon John Wampanoag making a living conveying cargo. “Dawn of Battle” features Capt. Jane Roland (later admiral and Laurence’s lover) taking charge of her dragon and crew as her mother never dared to do. A literary what-if, “Dragons and Decorum,” presents dragon-captain (!) Elizabeth Bennet, her dragon, Wollstonecraft, and her suitor, a certain Mr. Darcy, in action during the French invasion of England detailed in Victory of Eagles (2008). And the drabbles form an intriguing bunch: readers will have enormous fun working out where, or even if, they fit into the series, with outtakes from various times, locales, and events, whimsical sketches (Temeraire reads Beowulf, much to his confusion), and still others that hint at alternate worlds within alternate worlds (a dragon egg attended by robot servants hatches on an alien planet). All too brief, alas, but a must-read for all fans of this outstanding series.